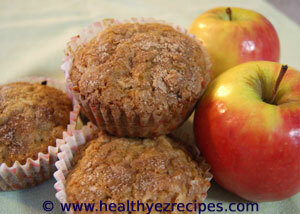 These apple muffins are deliciously moist and light with the addition of cinnamon and just a hint of cloves. Cloves go so well with apples. I’ve also used golden caster sugar (also known as raw caster sugar or golden granulated sugar) just to give some added depth to the flavor. And the healthy meter has been ramped up with the addition of whole wheat flour. I’ve used half whole wheat and half white. Preheat the oven to 190°C / 375°F. Grease a 12 hole muffin tin or line with muffin cases. Measure out your flour and sugar. These muffins need to be mixed very quickly so it’s necessary to have the dry and liquid ingredients mixed and ready to go. Into a bowl add both the all-purpose and whole wheat flour, baking soda, salt, cinnamon and ground cloves. 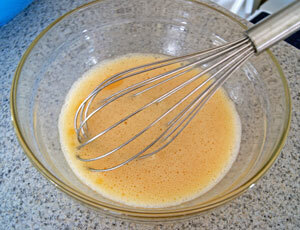 Stir the mixture with a whisk to ensure all the ingredients are thoroughly mixed. Add the sugar. Beat the eggs, then add the oil and vanilla extract. Stir until the eggs and oil are incorporated. Peel your apples and remove the core. I used Granny Smiths for this recipe. 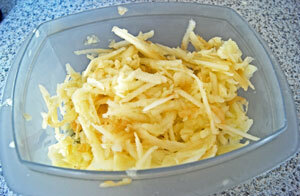 Then grate the apples using whatever grater you have on hand. Leave this step to last before the mixing stage, so that the apples don’t go brown. If they start to brown, sprinkle them with a little lemon juice. 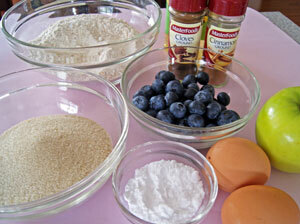 Make a well in the center of the flour and add the beaten egg mixture. Gently fold through until almost combined. Add the grated apple to the muffin mixture. 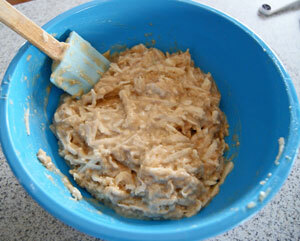 Continue mixing until the apples are evenly incorporated through the mixture and there are no streaks of flour. 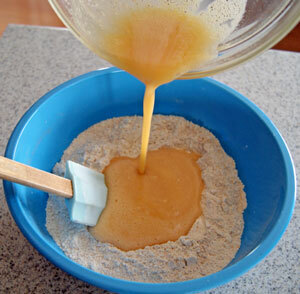 Once you reach this stage discontinue mixing so you don't overwork the mixture. Spoon the mixture evenly among the muffin tins. Bake in the oven for 15 - 20 minutes. The muffins should spring back when lightly touched. Leave to cool in the tins for about 5 minutes then turn out onto a wire rack. Use this muffin recipe to create even more delicious muffins.